Chancellor Cunningham and NU grads celebrate on field at Petco Park. One of my favorite quotes is attributed to Abraham Lincoln and Peter Drucker, "the best way to predict the future is to create it." I’ve shared these words with graduates during commencement, with faculty and staff members during meetings, and once again it rings true, as we reflect on the accomplishments of 2016 and focus on what we want to achieve in the coming year. 2016 was a historic year for the National University System. We welcomed three new university presidents: Dr. David Andrews at National University, Ms. Debra Bean at John F. Kennedy University and Mr. Randy Frisch at City University of Seattle. Our new presidents are passionate about transforming higher education and it has been a pleasure collaborating with them to implement the 2020 NUS Strategic Plan to provide an exceptional student experience. As the National University System emerges as a model for the future of higher education, each of these university presidents will bring the vision, experience and academic credentials to move us forward. 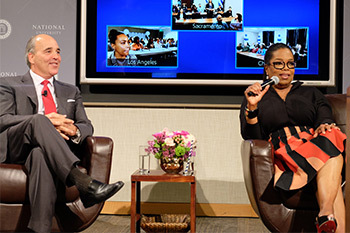 Chancellor Cunningham and Ms. Oprah Winfrey conduct a Q&A with students following Ms. Winfrey’s lecture April 7, 2016 in the Sanford Education Center, La Jolla, CA. Earlier this year, we were honored to host global media leader, Ms. Oprah Winfrey! Her message about living a purpose-filled life was an inspiration to us all, and her visit represented a remarkable moment for the University community to share in such a unique and meaningful experience. We are always excited to celebrate the achievements of our students during the most significant event of the year – commencement. 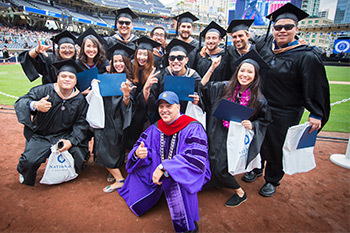 This year’s graduation added an additional thrill with National University’s inaugural commencement ceremony at Petco Park, home of the San Diego Padres and 2016 Major League Baseball All-Star Game. Members of the Board of Trustees and Chancellor Cunningham welcome NU President Dr. David Andrews in April 2016. As we welcomed more alumni to our network, we continued to develop meaningful resources for our current and future students. 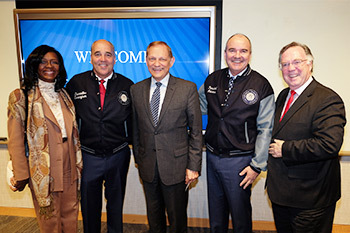 For example, John F. Kennedy University opened the VALOR Center and Student Success Center to support veteran, Hispanic and underserved students achieve their education goals. City University of Seattle partnered with Cornish College of the Arts to open a state-of-the-art 20-story residence hall located in downtown Seattle and opened a new site at Joint Base Lewis–McChord, the Northwest’s largest military installation, to provide on-base education to our nation’s service members. In addition, the Sanford Education Programs, inspired by the vision of our friend T. Denny Sanford, have continued to grow not only across the National University System, but also nationwide. This has been a very memorable year, and I’d like to offer a special thank you to our Board of Trustees, faculty and staff for their dedication to supporting our students. I’d also like to thank our students and alumni for continuing to inspire us with their commitment toward achieving their education goals. As we look toward 2017, and we all work to ‘create the future,’ I am excited to build upon the foundation we have set this year with initiatives such as the Innovation Grant Program. I look forward to further developing the innovative programs and services that keep the National University System a network of distinctive, leading-edge universities. I want to thank everyone again for all of their hard work this year and wish everyone a safe and happy holiday season!